The PARCC test has been on my mind a lot lately, due to its piloting all over the world (or so it seems, even though I know it is only in PARCC states). More and more news items are coming into my RSS feed of parents opting out, of teaching refusing to give it, of superintendents telling families how much they don’t like it already, of parents at a school in my city picketing PARCC with signs and everything, of criticism that our state Educational Commissioner has a role in the PARCC consortium, of talking to teachers at my school (and parents of kids) who administered the PARCC pilot (although they are not allowed to talk about the test), and more, more, more. A very powerful piece ran in the New York Times opinion section by Elizabeth Phillips that is a must-read: We Need to Talk About the Tests. And I saw from Diane Ravitch that Pearson, who is developing the PARCC, is searching for scorers, but they are targeting college students and paying only $12 an hour. These are the scores that are going to be used for teacher evaluations someday down the road? for student graduation requirements? Ack. for revising the PARCC? (cue fake laughter on that one). It’s hard to keep an open mind with all that floating around. 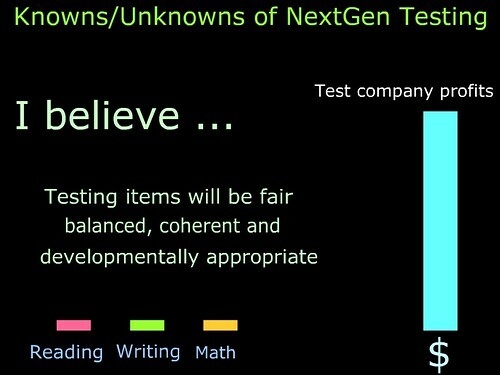 So, I went and decided to make a completely unreliable infographic of what I believe will be the end result of PARCC, which is that the testing companies will make out like bandits in the end. ‘Cause they will. Read Valerie Strauss’ piece at The Washington Post: March Madness. Meanwhile, with the federal test-creating grants running out later this year, the future of the two consortia is not clear. But for now, they’ve got a pretty good deal: They get millions of field testing subjects — for free. This entry was posted in Common Core, Homepage. Bookmark the permalink.